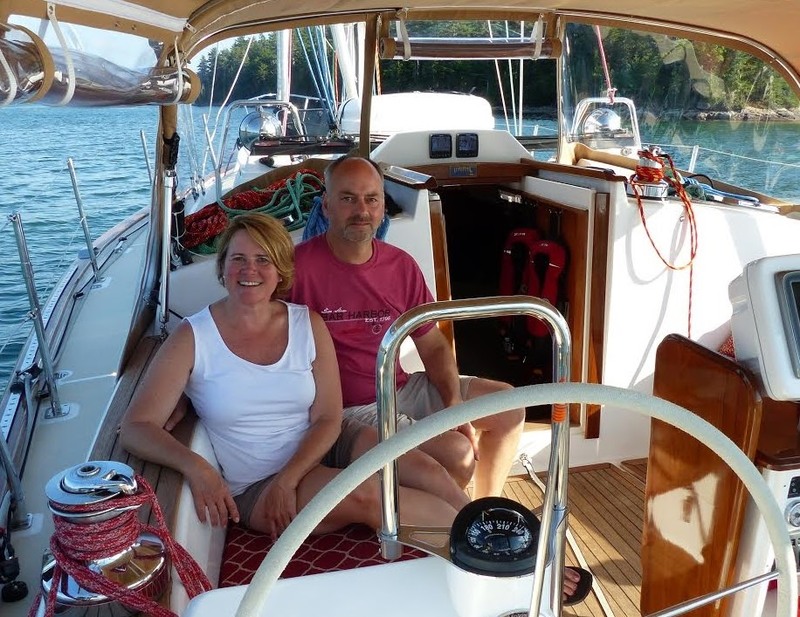 Argon and crew were completely ready to depart on our long awaited one year sailing adventure. But wait, the bright lights call... Argon was asked to be in a movie! Isaac Alongi is a photographer, cinematographer and Emmy award winning director based in Kansas City, New York City and Chicago. Isaac partnered with his wife, Sandra Martin, to release their first independent full length film, Trust Fund earlier this year. Their newest project, a romantic comedy entitled How to Pick Your Second Husband First, was also written by Sandra and will be filming at many Boston locations throughout September. 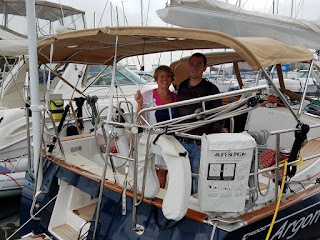 Isaac desired a classic looking sailboat for a brief scene in the movie out in Boston Harbor and found our company, All Hands Sailing Charters, via Google search as most of our charter clients do. However, he was not looking for our standard Boston Harbor or Island Loop package. After a couple of conversations, Argon and Isaac seemed like a good match for his movie. 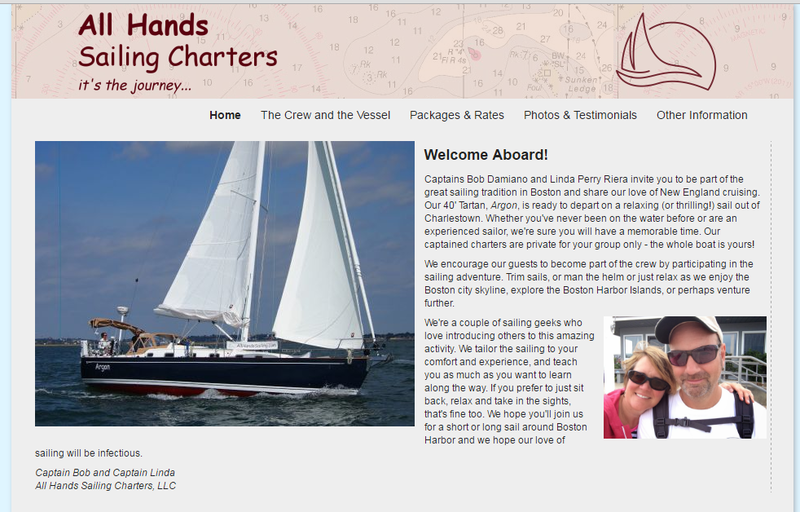 Argon was spotted from our charter website, All Hands Sailing Charters. 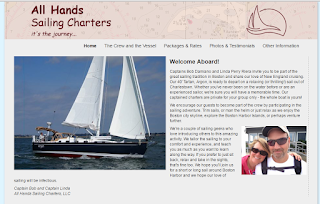 We started this company in 2013 hosting private charters in and around Boston Harbor. We settled on Tuesday 6 September for the date of the filming adjusting the initiation of our one year cruise by a few days to accommodate. This worked out just fine given that we had tropical storm Hermine meandering up the east coast confounding the conditions for the final holiday weekend of the summer. 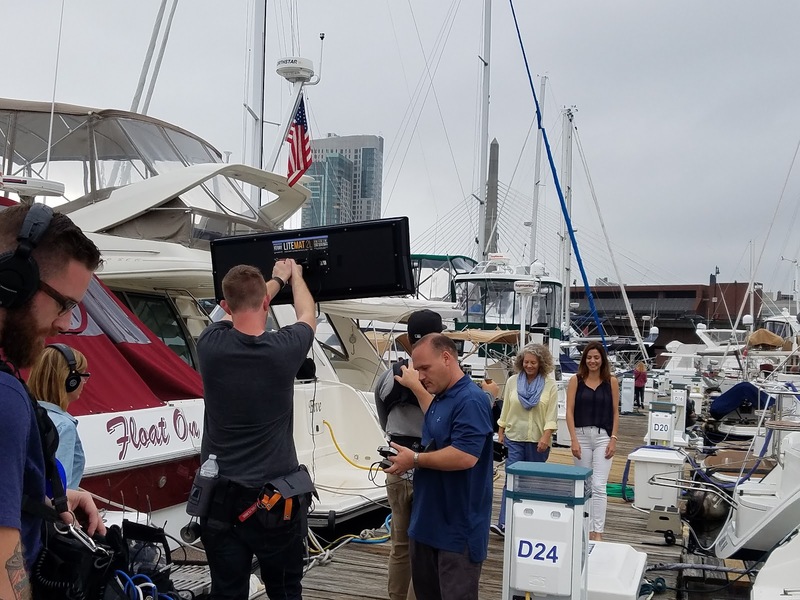 Hermine also interfered with the plans for the shoot as conditions were still poor on the scheduled date with intermittent rain and brisk winds in the harbor. 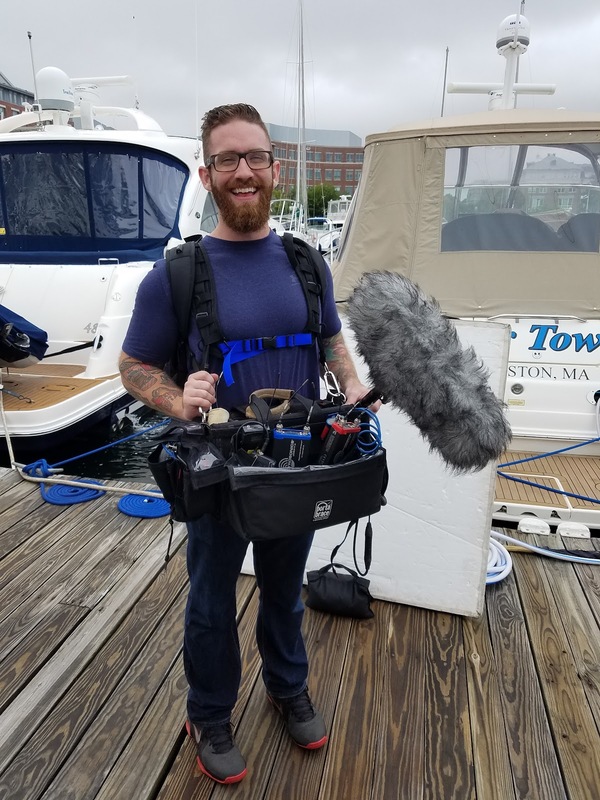 Isaac and Sandra skillfully shifted gears by adjusting some of the dialogue to situate the scene as if the crew had just arrived on the docks to escape impending bad weather. In addition to Isaac and Sandra (director/producer/writer) there were three actors as well as a Film Crew consisting of Camera, Sound, Lighting and Makeup people. There was also a lot of really cool gear. Isaac adjusting the camera preparing for the shoot to begin. 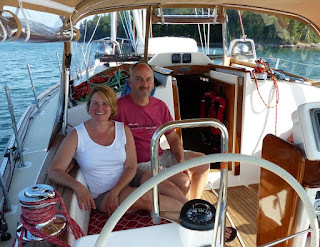 Staying on the dock made the work for Bob and I much simpler compared with taking passengers (with lots of expensive filming equipment) out in to the windy harbor. 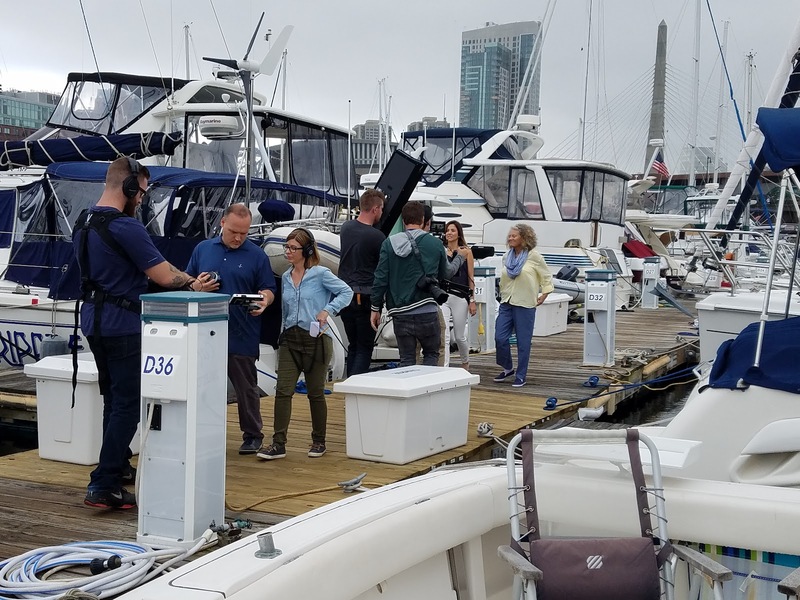 We ensured the boat was clean and orderly, adjusted a few items on Argon to be out of the way, and showed the actors how to coil lines and otherwise move around. Director and producer, Isaac and Sandra; and the three actors playing Jill, grandmother, and grandfather. The main character in the film, Jill, is played by an Argentinian American actress Julie Gonzalo. The shoot opens with Jill returning from a sail with her grandparents. Jill is a marriage counselor going through a divorce and receiving some relationship advice from her grandmother for this particular scene. 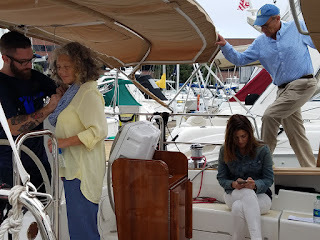 Main character, Jill (played by Julie Gonzalo), conversing with her grandfather on the bow of Argon to prepare for the scene. 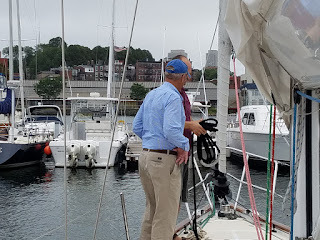 Bob teaching the grandfather how to look sailor-like coiling lines on the bow. Linda trained the actress playing the grandmother on some basic line handling in the cockpit. The three actors playing the grandmother, grandfather, and their granddaughter. The grandmother is getting her microphone attached. 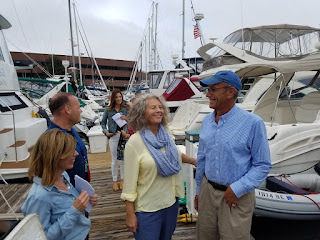 Isaac and Sandra liked the look of the boats lined down the dock and decided to have most of the conversation with Jill and her grandmother walking down D Dock, hence many D dock boats will be spotted in the scene. 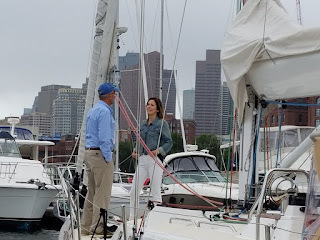 There are some other shots from along C dock as they sought to have the mass of masts and city skyline in another view. Adjusting and tweaking how the scene will proceed with main character, Jill, and grandmother conversing as they walk down D dock. Bob and I mostly try to stay out of the way. After about six takes, it's a wrap. Although more simple than originally planned since we stayed dockside, it was fascinating to see the planning and coordination. We enjoyed chatting with the crew and actors and Bob drooled over all of the gear. After Isaac and crew left, we got Argon back in order and turned our attention to getting ready to depart on our big trip the next morning! Another post will be forthcoming soon to update all on the initial days of our BHAG (Big Hairy Audacious Goal). 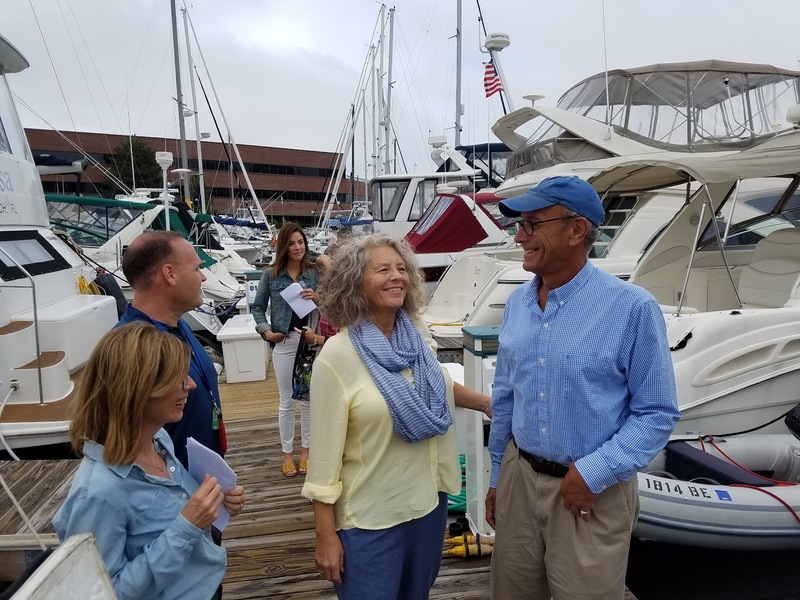 A wonderful visit and dinner with my son, Christian, was a perfect way to end our last day at Constitution Marina and to mark the start of a new chapter. Farewell dinner with my son, Christian, was a perfect way to not only end this day, but to emotionally prepare to truly cast off the lines. And, I think we are ready to go now! I wish you both a wonderful and happy adventure! I look forward to seeing pictures of your trip and to reading more stories. Take care, enjoy and bon voyage! David R.